You didn't think Stan Lee would leave this world without creating one last comic character, did you? The Marvel Comics founder and his daughter, Joan Celia "J.C." Lee, were collaborating on a new superhero right up until the weekend before the comic book icon passed away. Lee died on Monday, November 12 at the age of 95 after being rushed to Cedars-Sinai Medical Center in Los Angeles, California. J.C. revealed during the Tuesday, November 13 episode of TMZ Live that she had spent her "entire life" trying to convince her father to partner up with her to bring into existence a new vigilante. For years, her attempts were fruitless, and so J.C. independently developed a concept for a hero named Dirt Man. Eventually, Lee agreed to pool his creative resources with his daughter's, and the pair put their heads together to iron out the details for Dirt Man — a character who apparently isn't like any other crime-fighter in the Marvel Comics world. "We have been working on a character called Dirt Man. The last little angel we've got tucked away is called Dirt Man. I said, 'Daddy please, no clatter, no steel, no any of that. Let's get down and dirty. Let's do what's going on about love. Let's do Dirt Man,'" stated J.C., who affirmed that she plans to complete Dirt Man's characterization in her father's absence. J.C. kept a tight lip on Dirt Man's abilities and backstory, leaving us with a litany of questions. Can the hero manipulate dirt, or is he made of it? Was he an average, everyday working-class guy who had an unfortunate dirt-related accident that imbued him with super-strength or, like, the ability to cause mudslides and dust storms? Was Dirt Man a garbage collector before he was a hero, and now his mission is to clean his city's streets of trash and criminals? Or is he actually a neat-freak who can't stand the sight or thought of dirt and dust, and his hero name is just a cheeky joke? All J.C. could say about Dirt Man was this: "It is very interesting. It's not over yet, we still have a little trickery." And when asked if Dirt Man might ever get his own standalone flick or trilogy in the Marvel Cinematic Universe, she answered, "I hope so." J.C. also mentioned her plans to create a childhood literacy foundation in honor of her father. "We're creating the Stan Lee Childhood Literacy Foundation," she shared. "The importance of the written word and the importance of reading is not to be underestimated. One reason Stan is 'Stan the Man' is he took his craft very seriously. There's a lot to be passed on to children about reading and writing, maybe doing competitions — we're taking this as far as we can take it. And there's a lot to say to pass on to children about reading and writing." Audibly choked-up, J.C. then spoke about her father's legacy and his longtime love for his fans around the world. "He gave it up for everyone. When I was in my early teens, I worked at Marvel. I used to open up the fan letters. Where my father could, he opened every fan letter," she said. "He loved them and it's all about the fans. My father loved them so much." After Lee passed, J.C. honored his memory by calling him the "greatest, most decent man." We can't say for certain whether comic-book-lovers will ever get to read an issue introducing Dirt Man, or whether MCU faithfuls will one day see Dirt Man up on the silver screen leading his own solo movie. 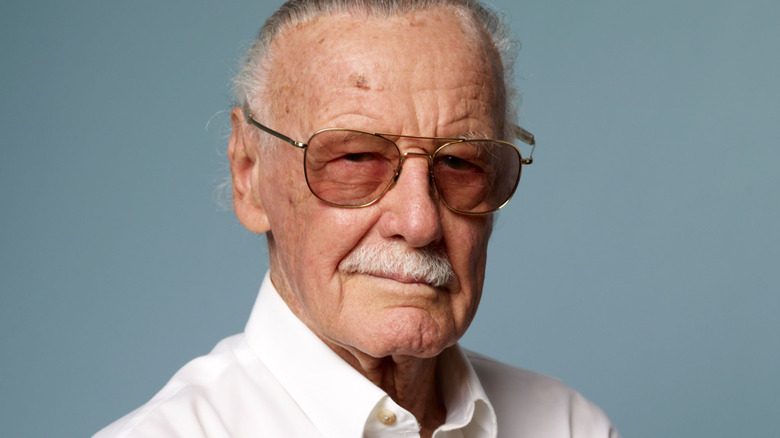 But what we know to be true is that every character Lee helped create — including Spider-Man, Black Panther, Iron Man, the Hulk, the Fantastic Four, Doctor Strange, many of the original X-Men, and dozens more — has been incredible, has amassed legions of adoring fans, and has changed comic book history forever. Dirt Man should be no exception. Our continued thoughts are with Lee's loved ones during this time of mourning.